Jim, I find that 4 qts plus 5-7 oz's get my '10 up to the full line with a new filter. I put 4.7 quarts in mine since new. Does anybody read or own an owner's manual these days??? I know MY bike came with one. Following the Manufacturer's recommendations (car or bike) within the guidelines of the owner's manual will save you ALL kinds of headaches in the long run. Reading the manual is the first thing I do when I get a new vehicle, of any type. Just RTFM. from prior posts by o/p, he isn't apreciating the silly stuff sometimes... so lets help him along, eh? download the users manual... it's all in there.... and I'll even give you the link.... doh. personally, I remove filter and oil, install new filter, and pour in 4 quarts, and 20 ounces, and cap it... done. do not torque the new one like that, tighten it by hand, one hand, till it wont turn, then give it a half to 3/4 more with a wrench... and call it tight....tighten it using a normal filter wrench/cup wrench... that's fine. just don't ask what tires are recommended, or what BRAND of oil... because it will make your head spin again. best of luck, ride safe. I use this one. 3/8 drive and a short extension. I put a small strip of rubber on the inside so it gets a good grip on a filter body. I'm hearing ya, and I toasted one of those also once, along with another strap wrench like it with plier handles, and 4 cup wrenches, and an expensive 'aluminum flat specialty end wrench, and ended up jambing a cup wrench on, and shooting a Tek screw thru it into the filter, to remove it when it was tightened to 13 ft/lbs...the strap wrenches end up crushing the canister, smaller and smaller each time you add more rubber.. Mine has worked years and years on bikes and cars. Sorry you had different experiences. 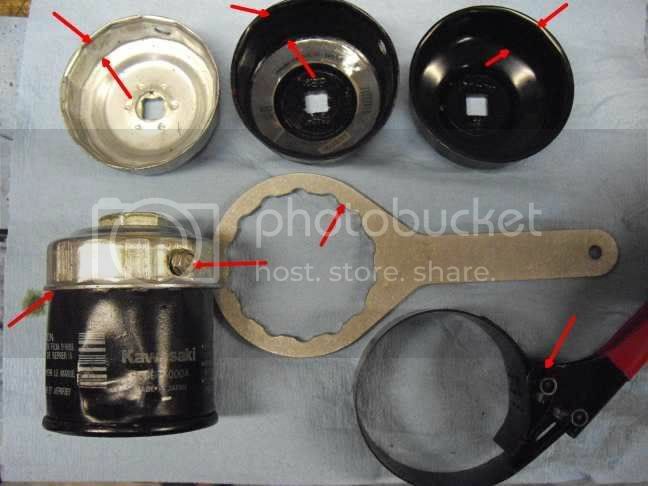 I have never had issues removing mine, using a oil filter socket. Though I sometimes simply use the, spin on until gasket touches, then tighten 3/4 turn, I also have torqued it according to the manual, and it always comes off easily. A torque wrench designed for that range is essential though, or it will be over-torqued and hard to remove. As for the old strap type oil wrenches, I stopped using though about 36 years ago. I did send a couple emails back and forth with the "Kaw Tech dudes" I was in contact with back then, as Tech Editor, and they responded with "we will look into it, and advise a revision to the factory manual for the next print revision". Like Phil I use a filter socket I got at Walmart and have not had a problem including the factory installed filter removed 10 years ago. Had I not bought a filter socket I probably would have stuck a screwdriver though it too. I use a filter socket. It works great! I always torque the oem filter and I've noticed that the o-ring compression is controlled by that torque. The filter housing feels like it bottoms out right at 13ft/lbs. Anything less feels like the 0-ring isn't compressed sufficiently. 13ft/lbs is not a lot of torque. Next oil change, remove the filter and remove that o-ring. It's not flat, at all. The K&N kn303 filter torques the same also, bottoms out right at the 13ft/lbs. It has 17mm hex that is convenient. Matches the drain plug. Just exactly HOW are you guys measuring the TQ that is applied to a Filter??? Are you somehow managing to fit a proper torque wrench on to that special filter wrench, and measuring it THAT way?? I find it hard to believe anybody is going to this extra length to physically attain the torque ratio on such an item. I certainly have never done so, and don't see how it's possible to get one under the bike to perform such a measurement. However - I'm going to respectfully be disrespectful to your process, as I have never used a one of those end-cap filter tools that didn't "slip off" the end of the filter when trying to apply any relative amount of tq. to it -- be it 13 ft./lbs mol. You're correct: 13 ft.lbs is really nothing, but in reality, hand tight on these things is MORE than tight enough, as the heat from the engine seems to seal them up more than good enough to keep from leaking. I have YET to not destroy a filter (oem or otherwise) to remove it from the bike after a few thousand miles of use. And yes, I have tried both the end cap removal tool, and I now have the "Jaws of Death" as pictured above! And sometimes even the JOD don't quite work without some serious coaxing, swearing, and filter mutilation. My next stop is a K+N filter with the Nut welded on the filter housing. Each his own, I guess! I have used these for 10 years now. Just not worth it to me not to. Had an extra from one of the cars I sold that cross referenced to the Kaw so I thought I would use it rather than throw it out. Stupid thought. Back to the K & N.
This is all of the filters I've changed since APR 2017 on my new 2016 C14. Never had an issue with any of them. Not one issue! 25k miles since new. Never had an issue with any from my 2008 C14. Not one issue! 40k miles since new. Same wrench, removed them while they were still hot. I'm doing it correctly, even per Kaw spec's..
Why does my "process" work, time after time, dozens of filters, with a filter socket, and your process does not? FWIW, every filter I have taken off a new bike gets destroyed in the process. The factories over tighten for sure. On its first oil change my C14 filter can collapsed and then tore using a strap wrench. It was a mess. IIRC I ended up driving a screwdriver through it to get it to turn, no way the sheet metal would take the torque. To the OP regarding oil level, the window will let you see where you are at in the fill. Go slow with the bike level and check with the window at eye level for accuracy.